In the age of crowd sourcing and social media, it's easier than ever to get a pyramid scheme off the ground. Here are some helpful tips from accountants on how to spot a scheme, and what to do if you suspect you're caught up in one. Chances are, if you’re involved in social media or have simply strolled down the street lately, you’ve witnessed or been approached by someone making such claims. Ads splashed across telegraph polls and social media ‘friends’ that you haven’t seen in years popping up in your personal messages promising great returns and financial freedom. Pyramid schemes are everywhere and, sadly, they promise the thing that Australians value most – a work/life balance. In the year to October 2018 alone, the Australian Competition and Consumer Commission’s Scamwatch has had 286 reports of pyramid schemes, with losses totalling $601,560. In reality, the number of schemes and losses out there is likely much higher as, as the ACCC recognises, those in such schemes often try to recruit others without realising they’re involved in a scam themselves. Individuals fall prey to such schemes as the recruitment techniques are often highly advanced, using slick social media campaigns to draw people in, and, unfortunately, you were most likely pitched the scheme by someone you know and trust. “Those that can least afford it are generally those that get preyed upon and part with a large sum of money they’ll never see again,” Timothy Munro, director and chief executive of Change Accountants, told Nest Egg. So, how can you differentiate between a pyramid scheme and a legitimate business opportunity that you might be missing out on? According to the ACCC and credit regulator ASIC, there are a few key warning signs to look out for to identify a pyramid scheme. 1. In a typical pyramid scheme, you are often required to pay a ‘participation fee’ upon joining. This fee is often a substantial sum, even up to $5,000 or $10,000, and in return you’ll likely receive stock you will be required to sell. But, that makes sense, right? You pay for the stock to then sell back at a higher price and reap the returns? Unfortunately, that is most often not the case. Despite commonly promising amazing results, the products are often overpriced, difficult to sell into a saturated market, of little value or, simply, faulty. There are often minimum monthly sales quotas attached to selling the stock that require the individual to buy in bulk and pay back what is left unsold. Unsold stock cannot be returned on normal commercial terms. 2. The scheme is dependent on the individual recruiting new ‘investors’. This is the reason that aforementioned friend has likely surfaced in your inbox after years of no contact. The primary source of money to sustain pyramid schemes is generated from new participants signing up. 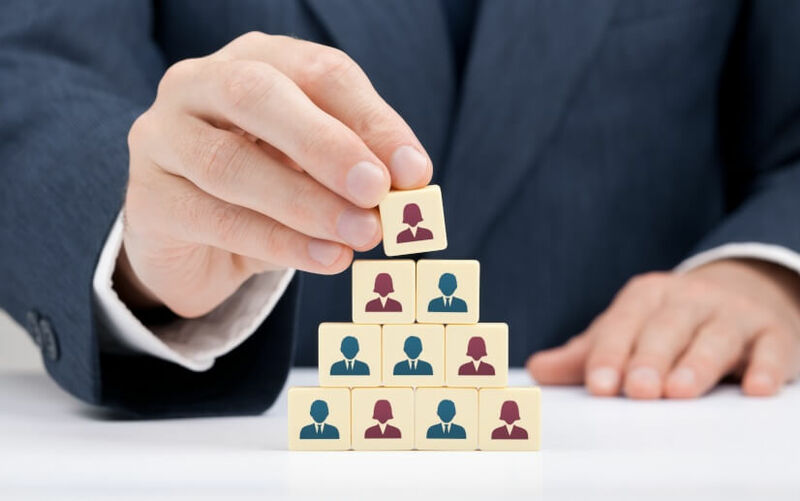 As a result, the scheme forms a pyramid structure, whereby those that invested in the scheme in the very early days are paid through the joining fees and product payments of new members. The higher the member, the more money they make. Relying on new recruits joining constantly is an unstainable model, as the chance of finding new members diminishes as more people sign up and, eventually, cut their losses and leave. The very nature of the scheme makes it certain to collapse. 3. The company makes grand promises about the work structure and the product. Both the ACCC and ASIC recommend consumers be wary of any scheme that claims a guaranteed income, quickly and with minimum work hours. “People who flog these schemes will generally make very ambitious claims about the types of rewards that can be made,” says Mark Chapman, director of communications at H&R Block. “Don’t sign up to anything that looks too good to be true in terms of returns. Generally, just use your common sense. If it looks too good to be true, then usually it is." “They often say, ‘I’ve had hundreds of people sign this and they’re happy with it,’ and you think, ‘Oh, I don’t want to be the goose that hasn’t done it,’ Mr Munro says. Mr Munro recommends undertaking the following steps before signing on the bottom line. 1. Read the relevant information on Scamwatch, the ACCC’s and the ATO’s websites to learn how to identify a pyramid scheme and see if the company that has approached you has been flagged as a scam in the past. 2. Google the product they will have you pedalling and read reviews. Look for comments people make about the quality and their satisfaction towards the company. 3. Ask the people who are offering you the business opportunity to provide the name and numbers of 10 of their current or past colleagues and give them a call. Ask them if they are happy with what they receive for the money they paid? Did they receive training? Did the promises of high returns ring true? 4. Make sure you are given a formal contract or agreement outlying the terms of your employment. 5. Most importantly, Mr Munro advocates for seeking the advice of an accredited accountant or lawyer in order to fully understand what you’re signing up for. “You should see an accountant or a lawyer, even for an hour, to look at the contract or the agreement and think, ‘Does this make sense?’ I’ve seen some absolute doozies,” he said. What can I do if I think I’m involved in a scheme? Unfortunately, Mr Munro said there is very little one can do once you’ve invested in a pyramid scheme. “In the majority of cases, once your money is gone, it’s gone and there’s no getting it back,” he said. Mr Chapman suggested speaking to an accountant who can potentially help you get the ACC involved. “By reporting it to them, at least you can potentially help other people,” he said.